Create a custom template or download a template from the Internet. You can find a number of free templates online. 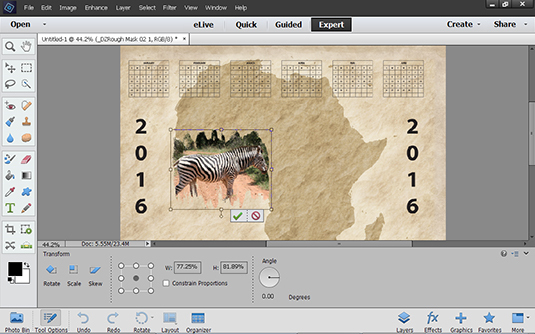 Perform a Google or Bing search for custom calendar templates for Photoshop Elements. 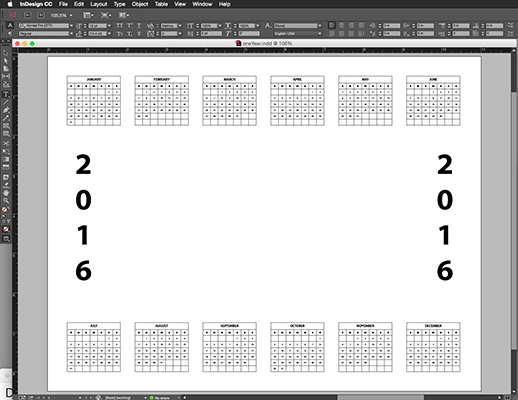 You can also find several calendar templates here. 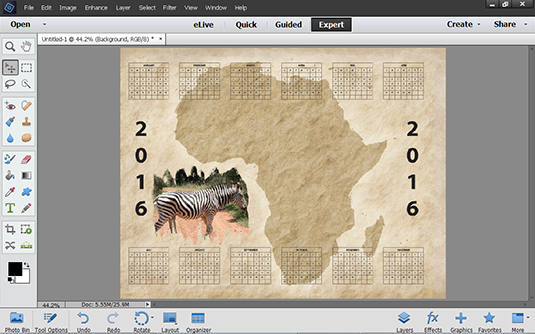 If you want to create your own custom template, use your favorite authoring application to create the calendar design and export the file as a PDF. Create a new blank document in the Photo Editor. Open the Photo Editor and chose File→New→Blank File. 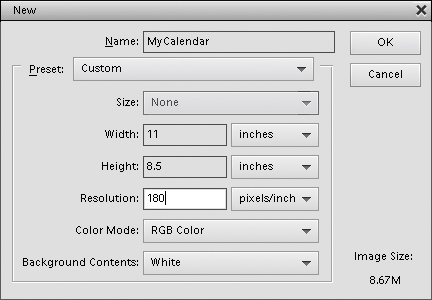 Set the page size and orientation in the New dialog box and set the resolution for your desired output. For PDF documents, choose File→Place. Select your template file in the Place dialog box and click OK. The Place PDF dialog box opens. If you have a multiple page PDF file, you can select the page and click OK. If a single page is in the PDF, click OK, and the PDF appears in your new blank file. Position the imported PDF document and click the green check mark to commit the placement. All the white area in your PDF document is transparent. Therefore the background appears through the template. Open the Graphics panel and choose Backgrounds from the drop-down menu. Scroll the panel and find the background you want to use. 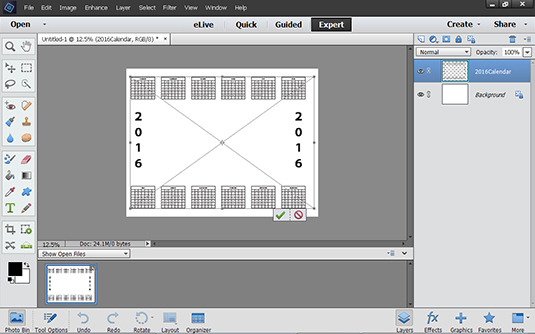 Drag the background from the panel to the image window. 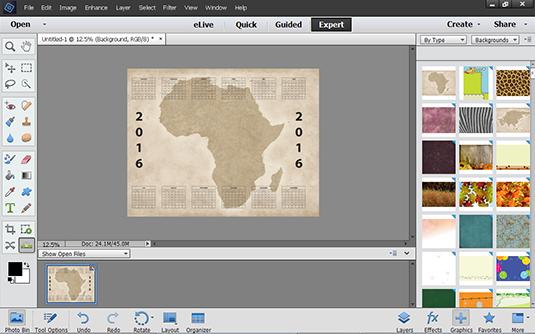 Open a photo you want to use on the template document in the Photo Editor and drag it to the template document. Position the photo and, if necessary, resize it by dragging the corner handles. When the photo appears as you like it, click the green check mark to commit the result. Save the file as a Photoshop PDF. Choose File→Save As and then choose Photoshop PDF (*.PDF, *.PDP) from the Format drop-down menu. Click Save, and the file is saved as a PDF. Review your calendar in Adobe Reader. You can print the file, send it to a printing service, or email the file to friends.